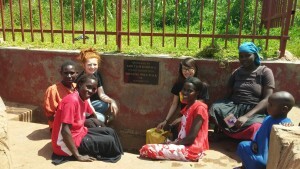 The well has made such a huge difference to the lives of many people in the community. It has helped to reduce the likelihood of contracting diseases, slashed the amount of money people would previously pay for clean water, or charcoal to make it safe for drinking or cooking… and has even helped boost people’s self-confidence because their clothes are no longer washed in muddy water. It’s amazing how far the positive impacts of this seemingly small project have spanned and I look forward to hearing about future water projects in other areas of Kampala. I’ve really enjoyed my time spent in Namavundu and it’s been a privilege to work with such warm and hospitable people. Zee’s research has been examining the impact that the women’s groups, supported by KCK, have had on their empowerment and agency. She’s been working all over Kampala, including Katanga, Mulago, Mutundwe, Komamboga and Namavundu, conducting focus groups, interviews and doing participant observations. The mushroom project in Katanga she found particularly impressive and we’ve both been very tempted by their craft products that are on sale in the guest house. Next week we’re off to conduct an impact assessment for a latrine project on Bunjakko Island so have to say a reluctant goodbye to the lovely people at KCK. But everyone here will remain in our hearts (…and minds as we slog through our dissertations) and we definitely hope to return in the future!"